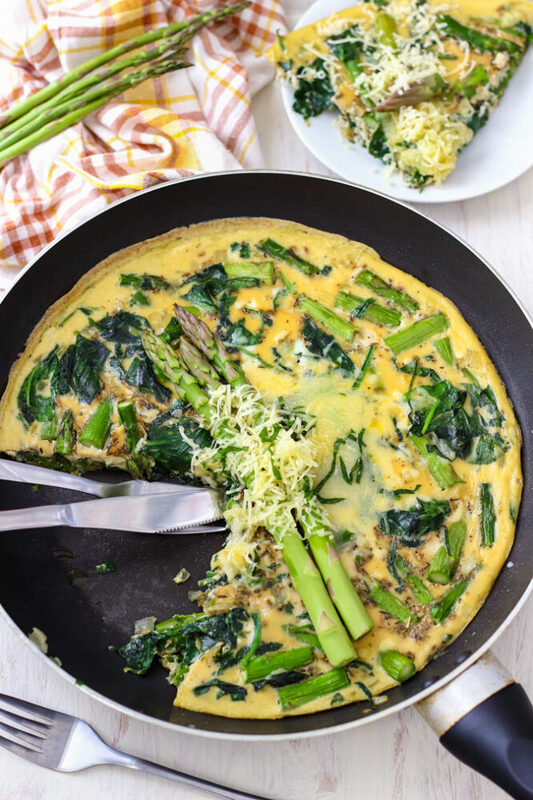 This light and fluffy Spinach Asparagus Frittata is easy to make and ready on your table in 30 minutes. Make it for breakfast, lunch, dinner or brunch! 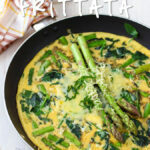 Like I have already mentioned this spinach asparagus frittata can be enjoyed any time of the day. You can also take it to a picnic, work or serve it at your next party! 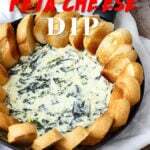 Just slice it into a bite size pieces (maybe wedges) and serve with some dip (a spicy one would be definitely the right choice here). I bet they will go down well. You see, I think about bite size food a lot because here in Spain everything is about tapas. Pubs and restaurants are full of them. The Spaniards can turn anything into tapas. They also serve their favorite Omelette Tortilla Espanola and Traditional Paella in small portions (a.k.a. tapas). 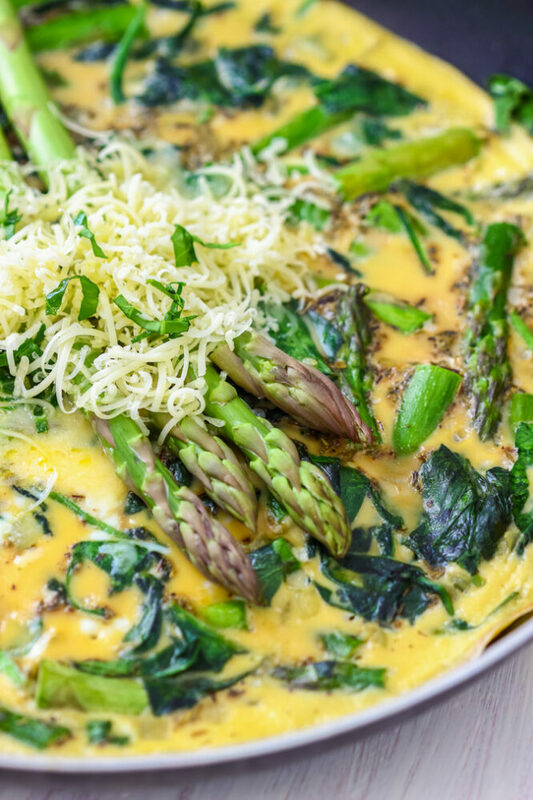 But let’s talk about this spinach asparagus frittata! Making it is easy and that is exactly what I like about it. 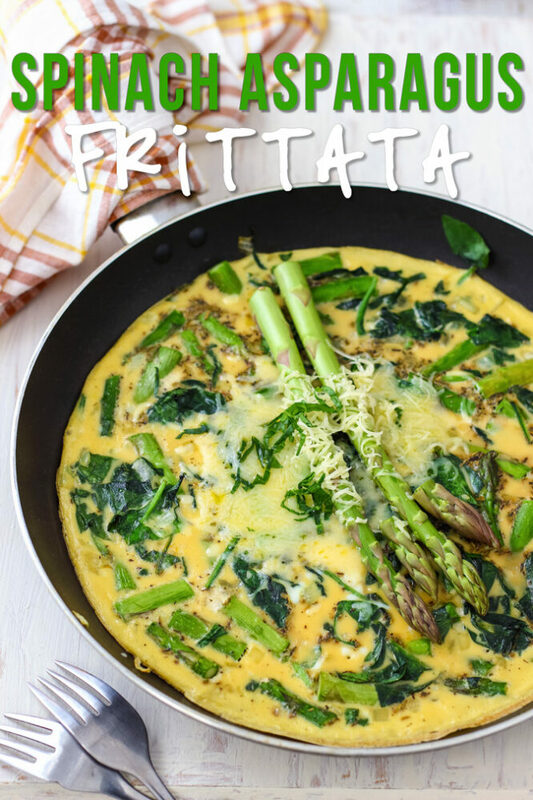 Many years back, frittata was the only thing I would make. I would add any ingredients we had in the fridge. No matter what I put in, it always turned out great. And that’s what I like about frittata. This time I made spinach asparagus frittata. There are only a few ingredients so it’s important to season it right. 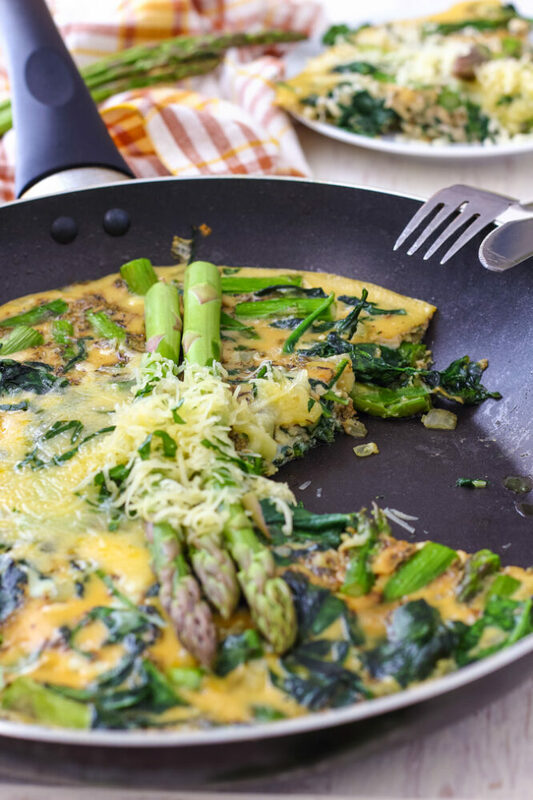 Spinach and asparagus will definitely give the omelette great flavors but we need something more. Something like onion and garlic. Garlic and spinach go hand in hand and onion is always a great ingredient to add to anything, really. I used 5 eggs to make this easy frittata. The eggs are whisked first. Now take your time. You want to whisk them well. Then add milk, salt, pepper and thyme. Give it a one last whisk and your egg mixture is ready to be poured over the veggies. Now sautéing the veggies will not take long. I’d say about 5 minutes. Start with onions. Sauté them for about a minute before adding spinach. If you feel like it’s way too much spinach for your skillet, then add this in 2 stages. Spinach will reduce its size significantly and pretty quick (like in a minute or two). Here are more delicious Spinach Recipes to try! 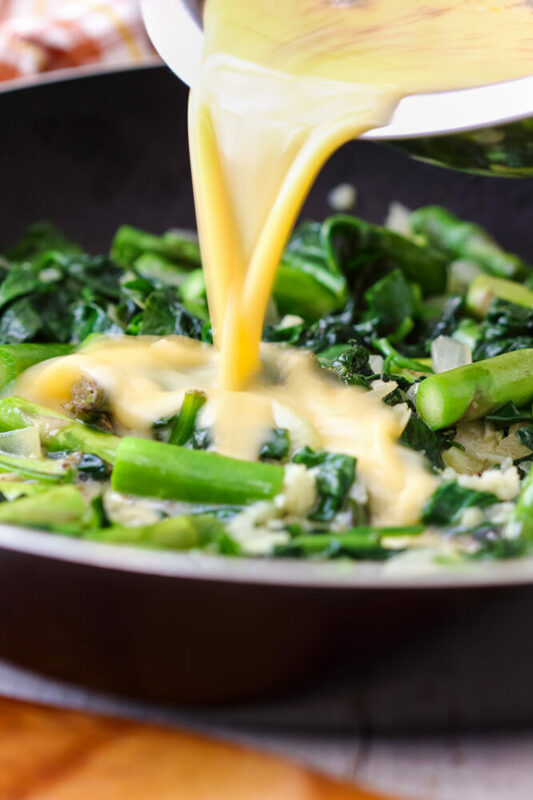 When you have enough space in the skillet, it’s time to add asparagus. Again, sauté this for about 2 minutes before pouring over the egg mixture. Reduce the heat and cook until you see the eggs starting to set around the edges. Then transfer into a preheated oven and bake until the eggs are set completely. 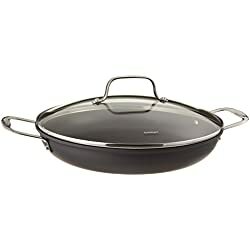 I highly recommend using a non-stick frying pan/skillet. It makes your life easier. Nothing sticks to it and you actually get the frittata easily out. Add as much cheese as you desire or omit completely. 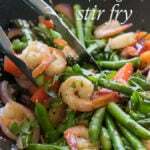 In an oven-proof skillet/frying pan, heat the oil and add diced onion. Sauté for about a minute before adding the spinach in. Sauté until the spinach has reduced its volume. Now preheat the oven to 400 degrees F.
Meanwhile: Wash the asparagus and trim off the hard ends. Cut the rest of the stalks into 1-1 ½ inch long pieces. Peel and mince the garlic. Add both the garlic and asparagus to the spinach and sauté for 1-2 minutes. In a medium bowl, beat the eggs. Add salt, pepper, thyme and milk and stir well. Pour this mixture over the veggies and cook for a few minutes. When the eggs around the edges start to set, transfer the skillet into the oven. Bake for 15 minutes or until the eggs are set. Top with grated cheese and serve warm or cold for breakfast, lunch, brunch, dinner or as appetizer. 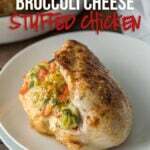 • Make sure to use an oven-proof skillet/frying pan. 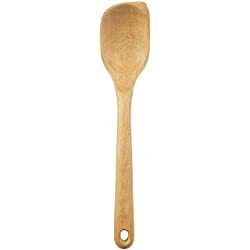 If you have one with a non-stick coating, use it. It makes a huge difference. 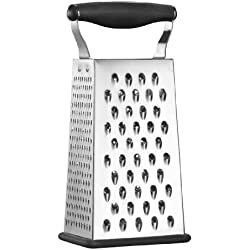 • Use less, more or completely omit the cheese. • Mushrooms can be also added, just reduce the amount of spinach a bit. Julia is the blogger behind Happy Foods Tube. On her blog she shares quick & easy recipes and delicious desserts. In her spare time she enjoys reading, traveling, cycling and beach walking.